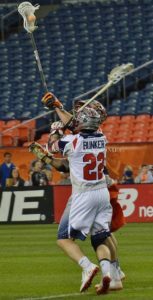 We went one-on-one with former MLL star and face-off guy #22 from the Boston Cannons, Craig “Scrappy” Bunker about lacrosse; his career; and retirement from the MLL. We’ll go over our questions and Craig’s answers along with things that can be instrumental in a young athlete’s desire to play lacrosse. We wondered what Craig thought was the most important thing to tell someone wanting to play lacrosse; if they should play one position or be a multi-positional player; and if you want to play college lacrosse does it have to be DI. One thing all players should do is play a lot of different sports. He noticed that other guys he played with or against during his MLL career, were all exceptional athletes in other sports and most likely could have played collegiately at some level. They weren’t just spectacular lacrosse players; they were exceptional in all sports. Craig only knew one guy who bragged about playing only lacrosse. He was a lax rat and had that mentality which definitely helped him. Watching as many face-off videos as possible, including ones from the Face-Off Academy® is important if you are looking at that position. The guys in the MLL watch videos all the time and know the talent that is coming onto the scene, so it’s a must to have the mentality and desire to play lacrosse. Craig said “At the end of the day, you must have fun playing lacrosse. It’s a sport; you’re doing it with your friends; you hang out; and you do it together. You just have to enjoy what you’re doing and love to run”. He was fortunate in his career as he really loved playing sports and played as much as he could. Be watchful of specializing at face-off at the higher levels because you could become a FOGO ‘face-off, get off’ player and see very little playing time. Craig was always fast and could get up and down the field. He enjoyed the offense and defense perspective so he always gravitated towards middie. Craig didn’t specialize in face-offs until he got into college. He took face-offs in high school because he was athletic, but they had other players on the team who were better in his eyes. He was recruited by Colby College as a defensive mid-fielder which helped him get the experience he needed as they didn’t have a face-off specialist at Colby his freshman year. We wanted to know who was his favorite guy to face-off against in the MLL. Craig had two, both spectacular players at the “X”. He said “Anthony Kelly came to mind first. It was his first or second All-Star game appearance and it was tied. At that time, Kelly was in the running for fastest shot in the MLL. He’s an enormous human being and couldn’t have been nicer. He was great with the kids and was great with me. He helped me coaching the kids and I just tried to eat up everything he would say. Fast forward a couple of years and I saw him again at a camp. He remembered the interaction we had a couple years back which was great. Fast forward again and we faced off when I was playing with Rochester and he was with Denver. That was very special to me because he was a guy I looked up to. Anthony went out of his way to be nice to me. I got his phone number and I’d text him periodically for questions or advice, he always responded with help. He’s a great individual and had a great career. What he’s done and what he’s still doing is really impressive”. Then he talked about his second favorite guy, John Ortolani. He lives 20 minutes from where Craig grew up in Boston. He was a DIII kid and he remembers the first time they met. He went out for a face-off in the winter of 2007-2008 when John was the best in New England going into his senior year. Craig thought to himself…this kid is a great guy and I want to be just like him, so much so that he bought the same lacrosse head as John because he didn’t know what else to buy. He knew John was good and knew he wanted to face off. Craig and John have taken thousands of face-offs against each other over the years. 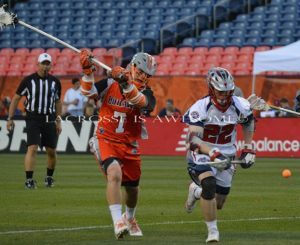 During his first year with the Boston Cannons, and the last game of 2013 against Rochester, he got to take some face-offs against him and said he was fortunate enough to go up against him during his MLL career. John is an MMA fighter and former wrestler. They would scrap against each other and with the history they had, being such good friends; coaching and travelling together, he’ll always be a special guy in his life. We know some players have a favorite song they like to warm up to. When we asked Craig, he had a different approach altogether. With the hectic atmosphere of pre-game, if he was too wound up it came back to hurt him. To him, every face-off is a new battle and if he focuses on the first one, he used all the energy and excitement in that particular draw. Therefore, he tried to stay more focused and relaxed. On Craig’s playlist, he had the speech Ray Lewis; a Hall of Fame linebacker for the Baltimore Ravens gave prior to their 2011 spring game. This speech was given during his senior year at Colby. Craig was a bit superstitious and stopped listening to songs before the game. He chose to listen to whatever was on the team iPod or whoever was DJ’ing. So what was the best thing that ever happened to Craig during his MLL career? Craig said being named to the 2017 All-Star Game as his top personal achievement, playing one half of the game. His second and third All-Star games, he backed up Chris Eck whose name and reputation speak for them selves. When Eck stepped away in 2015, he was the only face-off guy on the roster which gave him the chance to be ‘the guy’ and his first season as the starter. He said to be honored like that in his first All-Star Game was incredibly special. Then in 2015 when the Cannons played at Gillette Stadium in Boston, being a Boston kid and a diehard Patriots fan, he was honored to be a part of the 2015 playoff team. He felt extremely proud to have helped them achieve that goal. If he had to play another position, what would it be? He commented…”If I played another position it would be LSM. I love the fact that you have to be able to run; to get up and down; you have a six foot pole so you’re able to poke check guys; and you have to be great at offense and defense. You see guys like Joel White and Scott Ratliff who not only played great defense, but great offense as well. You get to have that defensive specialty but you also get to be a contributing force on offense. You’re not only going to score points, but the teams have respect for you and you can create opportunities for your teammates”. Last up for our questions with Craig involved his reasons for retirement and if he had to do it all over again, would he choose the same path. In Craig’s words “I recently moved to Minneapolis after living in Boston a couple of years ago. I was going to college there after moving from New York where I was working in the ‘financial services’ world. I was able to land a job in my career path within finance. I’m in private equity which was something I’ve always wanted to do. This was a career that I’m passionate about and interested in pursuing so I was willing to do whatever it took to land in a private equity position and for me that meant taking a position in Minneapolis. I didn’t play in 2017 although I was on the Atlanta Blaze roster. I polled a few different teams to determine my options. I was studying for financial services and had to use most of my time taking exams. I had to commit part of the season to that, but as the summer of 2017 rolled around, I figured if my schedule was free and I stayed in shape; kept working on my skills, that if a team had a need I would do my best to try and play. I was on the roster as a DNR ‘Did Not Report’ and in April 2017, I took a job in Minneapolis which essentially put the nail in the coffin. 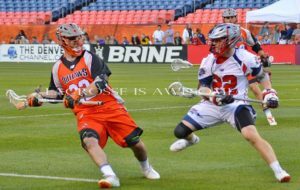 I thought about looking into 2018 to see what the possibilities would be; spoke with some of my co-workers; and was contacted by a few MLL teams about my interest and commitment level. Physically and mentally if that level was 100%, I’d love to be out there. I miss it every day. I keep in touch with my teammates on social media so I still feel connected in some way. It wasn’t my long term career aspiration so I put it all into my financial career”. “If I had to do it all over again would I stay on the same path? My dream as a little kid growing up was to be a wide receiver for the San Francisco 49ers and wear #84 when Steve Young was quarterback. I wasn’t a DI player coming out of high school, but I was always strong and fast. I didn’t have the stick skills or physical presence which coaches were looking for back in 2005-06-07, and I really believe that if I hadn’t gone to Colby and not played DIII, I would not have ended up in the MLL. I was in the right place at the right time; got in touch with the right people; and learned how to face off. I had a good work ethic; and support from my patents which allowed me to play in the MLL which was always a dream of mine. When I was a kid, I would go to Cannons games at Colby Stadium; Gillette Stadium and Harvard Stadium so for me to be able to play for the Cannons was as if everything came together full circle. I’m not sure what would have happened if I hadn’t gone to play at Colby and got recruited at the right time. So, I wouldn’t change a thing”. It was an extreme pleasure getting to know Craig and get his insights on a career in the MLL; growing up as a lacrosse player; and his new career. We wish Craig all the luck in the world in Minneapolis.